Dr Walker regards his involvement in research as an integral part of his clinical life. This belief underpinned the early aspiration to develop a scientific research base within cardiology at University College Hospital (UCH). The weight of clinical work as one of two Consultant Cardiologists at that time for two large hospitals (UCH and the Middlesex Hospital), meant that a different model to fulfil this ambition needed to be designed. Luckily, Dr Walker was able to recruit a scientist (Derek Yellon) to lead the development of the research and establish an Institute. Using financial support from a grateful patient to pump prime the project, the Hatter Cardiovascular Institute (HCI) was founded in 1990. It was accommodated by converting a dishevelled toilet area under the UCH casualty department into research laboratories, adjacent to the clinical department. 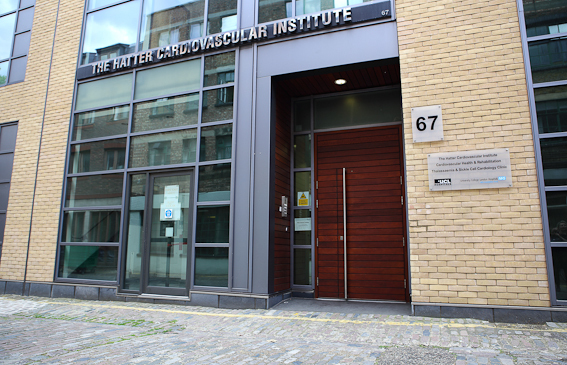 In 2006, the Hatter Cardiovascular Institute moved to a bespoke new building in Chenies Mews, opened by the then Prime Minister. 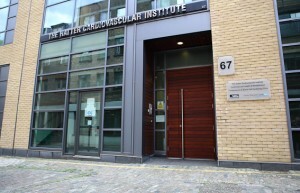 It incorporates offices and state of the art research facilities housed above a clinical area, which includes a dedicated gymnasium with offices and clinic rooms to house the Cardiovascular Health & Rehabilitation service of UCH, a service development also initiated by Dr Walker (in 1989) and for which he continues to be the Consultant Lead. Haemoglobinopathies: the cardiovascular complications of inherited diseases of haemoglobin, such as thalassaemia and sickle cell anaemia. Cardiovascular Health and Rehabilitation: achieving behavioural change to improve outcomes following a heart attack or cardiac surgery has been addressed by a co-operative project with the Department of Psychological Medicine at UCH. This approach is now fully integrated into the cardiovascular rehabilitation programme at UCH. This experience is being used to help develop cardiovascular health and rehabilitation services in Mauritius. One of the early research cardiology trainees was Dr Lisa Anderson. A joint British Heart Foundation project was supervised with Professor Dudley Pennell from the Brompton Hospital. This clinical study led to the development of a reliable technique to measure the iron content of the heart using non-invasive Magnetic Resonance Imaging (MRI). The T2* parameter was defined by this project and has become the accepted standard, world-wide, for the assessment of cardiovascular risk in disorders of the blood. Drs Mark Westwood, Mark Tanner and Paul Kirk followed in Dr Anderson’s footsteps, undertaking collaborative projects on MRI and Thalassaemia with Professor Pennell and Dr Walker. Dr Sunil Nair, funded by a British Heart Foundation grant and supervised by Dr Walker, completed a project culminating in an MD degree conferred in 2012. He studied the use of the echocardiogram ultra-sound technique in Thalassaemia. In collaboration with the nursing lead for the Cardiovascular Health and Rehabilitation Service Director at UCH, a British Heart Foundation grant was obtained to investigate the use of a self-management programme in cardiovascular rehabilitation. Out of this arose a manual, written in collaboration with the Department of Psychological Medicine, which continues to be used to guide this effective method of helping patients to adopt long-term healthy lifestyles, including regular exercise. Dr Emmanuel Ako is being supervised by Dr Walker and currently funded by a Biomedical Research Centre grant (a National Institute of Health Research funded body at UCH), to explore novel MRI and echocardiography techniques in Sickle Cell Disease. A grant from the BRC is being used to advertise for another research fellow to investigate novel heart protection techniques to reduce the cardiovascular damage caused by cancer chemotherapy. Cardiopulmonary assessment at rest and during exercise in patients with sickle cell disease (CARE-SCD).